If you think that your day was rough, you are not alone! Many people could relate to your struggle, no matter what it might be! As it turns out, not only people could relate! It appears that animals know what having a tough day full of problems and obstacles feels like and the following list gives some really nice examples of that! Some of the images might actually be relatable to some of you, which would make the list even funnier than it already is. 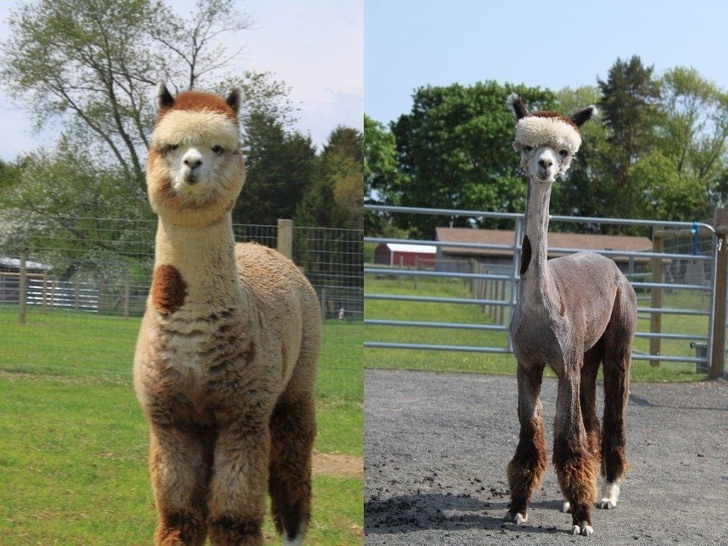 It is questionable if the owner of this alpaca gave it a trim or they took it to a place where a professional did it. What is more than obvious is that the end result does not appear to be a success. 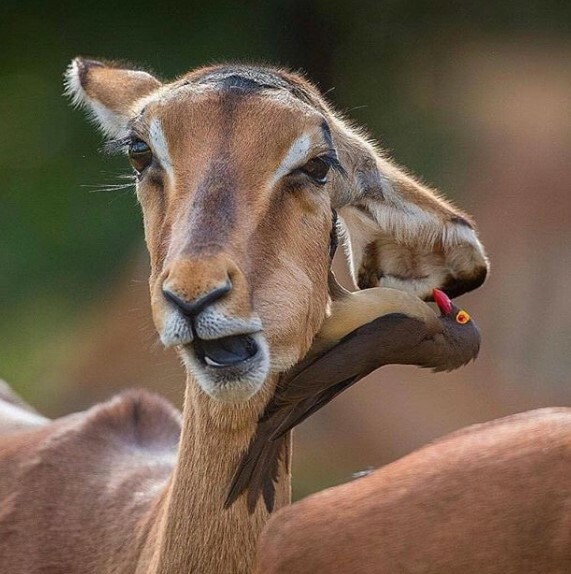 Of course, perhaps whoever did it did not strive to achieve good looks, but the animal looks like it knows how it looks like after the procedure and it is not happy about it! It probably felt more comfortable like that but we hope there are no mirrors in the stable! 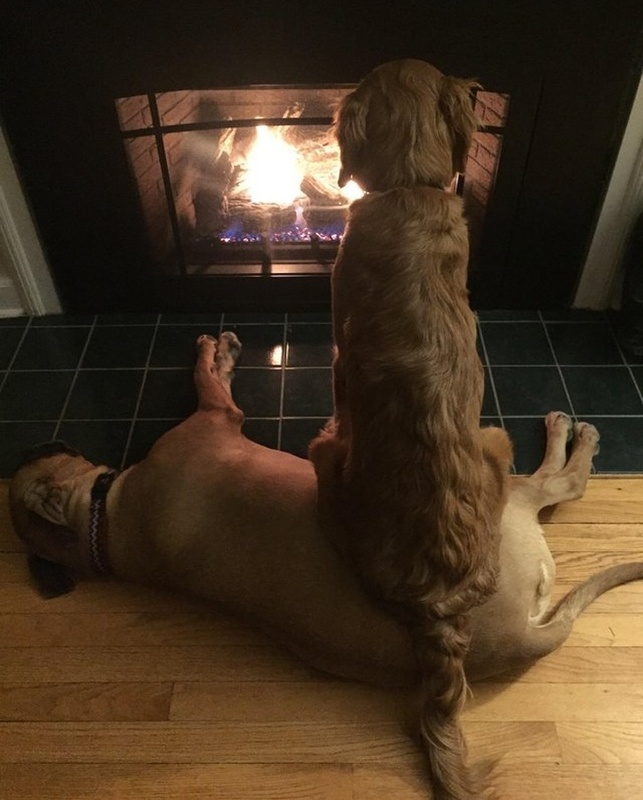 Sometimes people think that their dogs are capable of enduring all kinds of weather, especially if we are talking about a big dog with a lot of fur to keep it warm. Well, things are different in reality and while some dogs could actually cope with the snow and cold, it does not mean that they would prefer doing it! 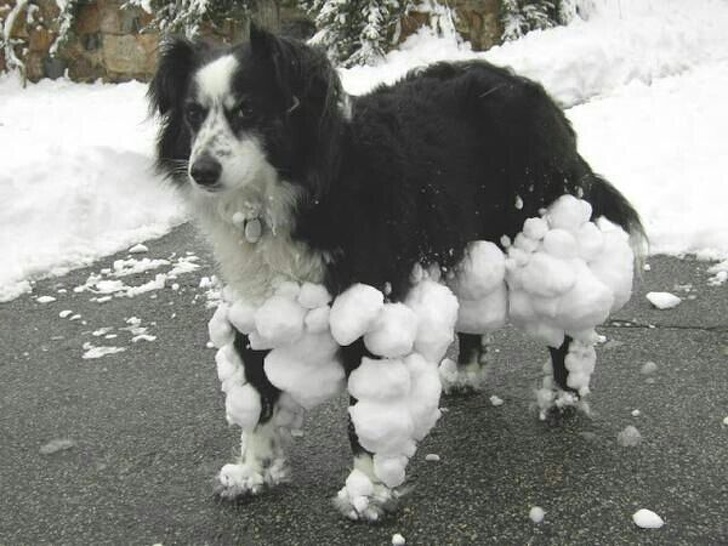 As you can see, this doggo is not happy with the aftermath of the snow walk, and we could relate to the way that feels. This cute trash panda is not playing around. It holds onto those rails because it knows that it was being taken to the vet for teeth-related procedures. It is easy to see that the animal is scared of that fact and it would be hard to let go! We know that feeling well, because we hate going to the dentist, too, and we have been scared of the buzzing sound of those machines all our lives! 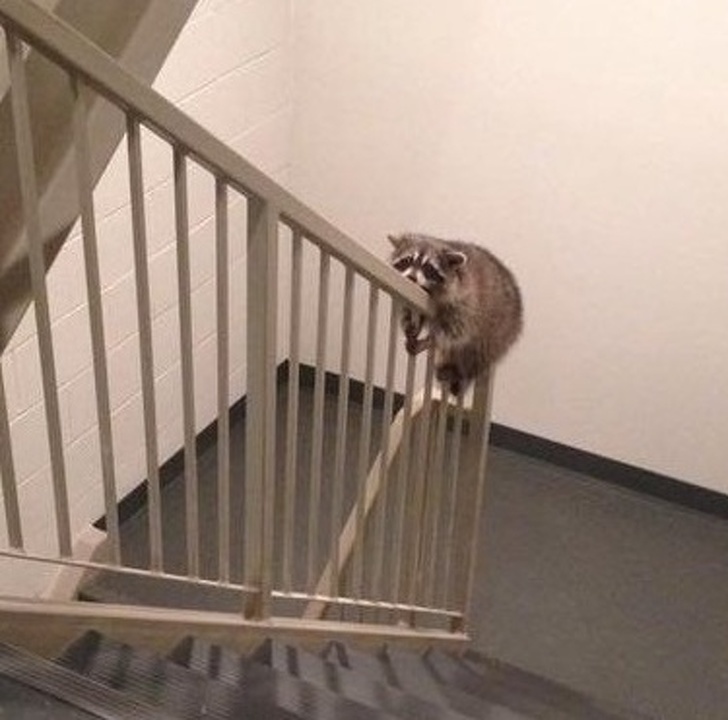 We guess that it is fairly easy to get in trouble if you are a little rascal, and we all know raccoons are notorious for being in trouble all the time! They are either stuck in a fence of a trash bin, and people free them all the time. This particular specimen, however, decided to try something difference. It almost looks like a stunt that the likes of Jean-Claude Van Damme would definitely try! 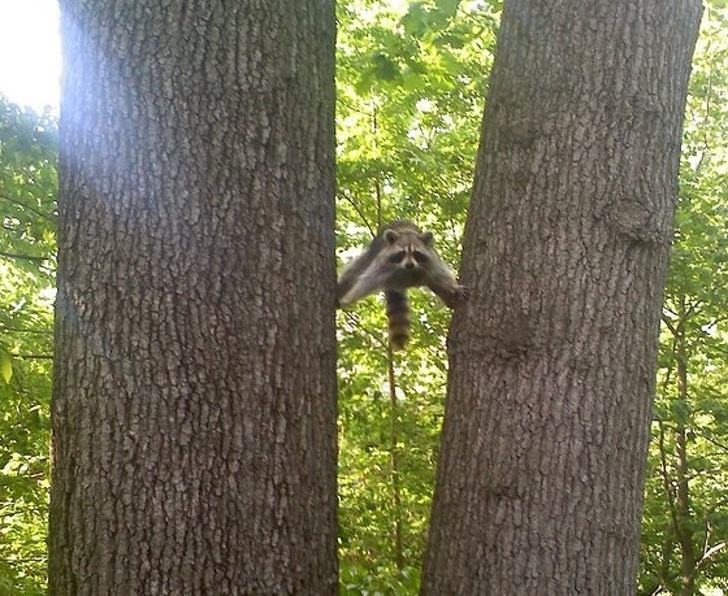 However, the animal seems to be stuck because the stunt was not well-planned. If there is one thing we despised as kids, it was the endless series of moments we were compared to other kids. Parents tend to do that and it is a mistake, unless the comparison is in favor of their own child, of course. This car probably knew that this particular comparison was not exactly accurate because, after all, the person holding it tries to compare a lion cub to an adult cat. Seeing the facial expression of the feline says enough, actually. We love deer! They are so majestic and beautiful that they look almost surreal! No wonder deer are included in many works of art – they simply look stunning! As you can see, this particular specimen has an even fancier appearance because of the accidental hairstyle made out of grass. 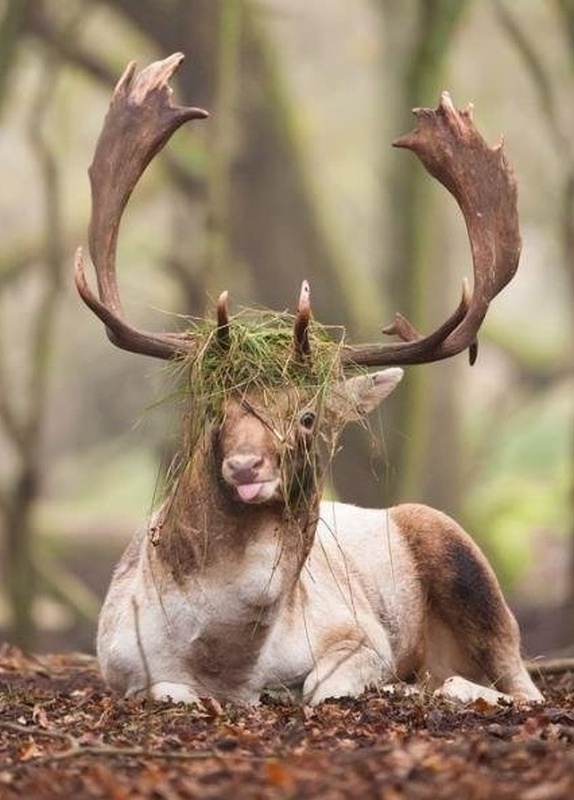 However, we guess that the deer does not feel comfortable with this new look and you can see that written all over its face! 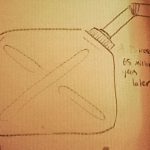 It would be hard to get rid of, too! Well, the photo actually says it all here and no caption is needed, but it is worth mentioning that his would probably happen to be one of the most relatable images on the list. There are many people who have experienced the same fate! Even if your younger brother is half your age, he might be twice your size, to say the least! The end result would most probably look like this image. The small dog probably had better days than this one. Some people say that animals have no feelings but they are wrong, of course. Animals feel the exact same things we do, with a few exceptions. In fact, pets can even express their feelings in a similar way to us! They can show they are angry, annoyed, happy or tired and you could always tell what’s happening. 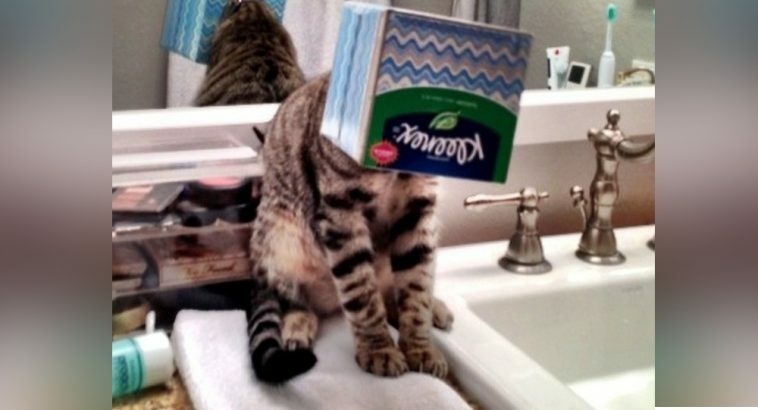 This is why we can all see what this cat feels. 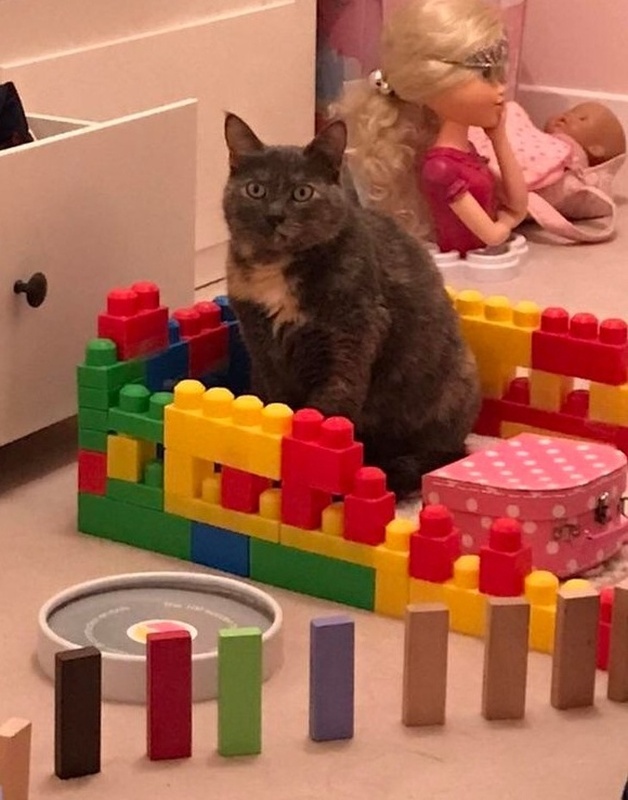 Its facial expression suggests that the cat is probably going to be used as a toy, and this probably happened several times before, too! 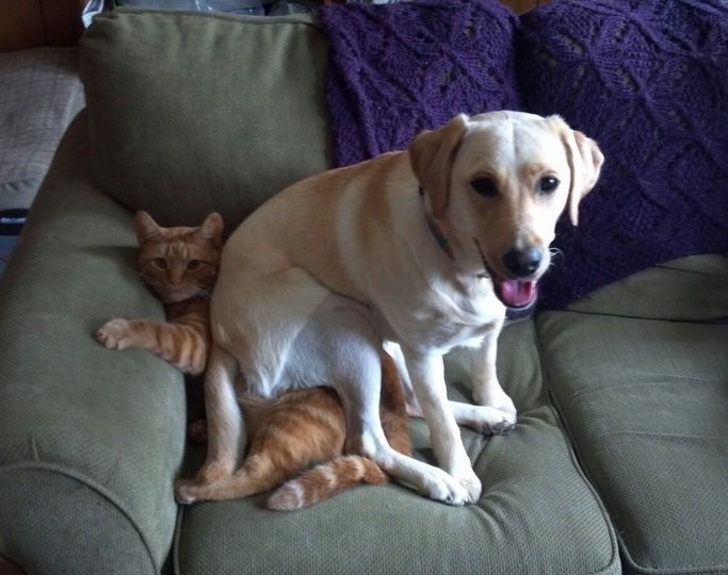 Here is a classic situation that every person who has a cat and a dog at home is familiar with. 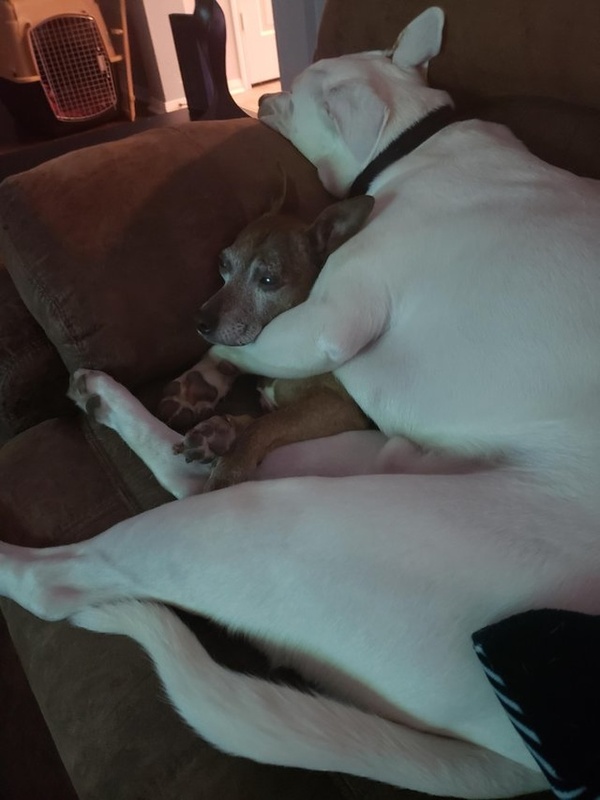 Even if they are best buddies, their differences often lead to hilarious situations! For example, the dog is usually a few times bigger than the cat, resulting in what you see in the image above. 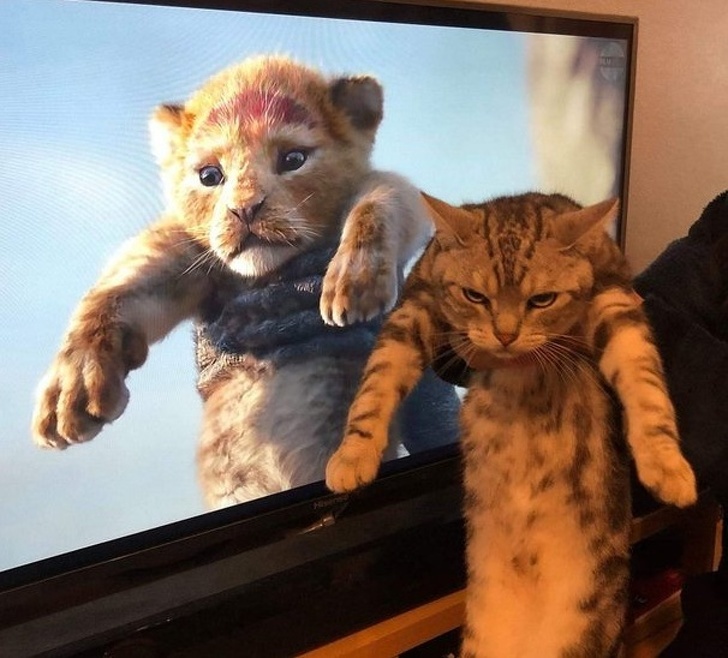 The funny thing about this particular situation is that the cat appears to be annoyed that the human who is taking the photo is not doing anything about the situation! We have seen a lot of unlikely bonds between different species of the animal kingdom, but this is something else! And we don’t just mean these two particular species; we emphasize on the type of their bond! As you can see, one of these unlikely friends probably has a severe headache and we would not stand that situation even for a second if we were part of it. Let’s hope it was all over soon enough. Seeing this image made us laugh and cringe at the same time! 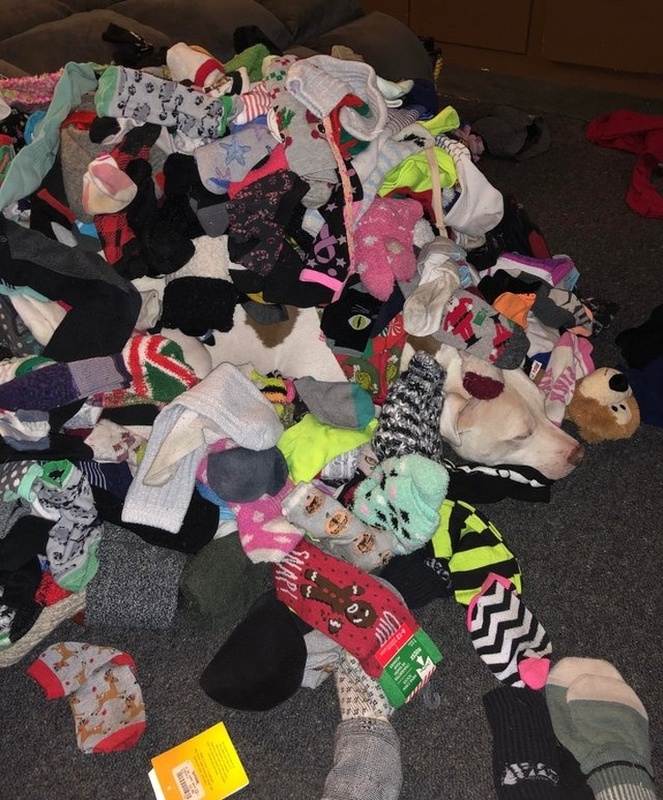 At first it was just a funny image of a huge pile of scattered socks, but then we saw it! A cute and fairly large dog is tucked in underneath that pile! And while the dog appears to be either taking a nap or it just gave up under all that weight, one thing is for sure – the person who took the photo would have to spend a lot of time cleaning this mess! As we already mentioned, there are a lot of similarities in pets’ behavior compared to ours. Maybe this is one of the reason we have pets, who knows. 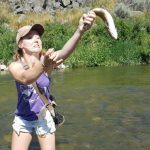 What matters is that in many cases the things animals experience are more or less the same we do, so it is no surprise that this one is fairly relatable to us humans, too! Using someone as a bench is a common thing, especially if you are a big man and your girl likes to cuddle. 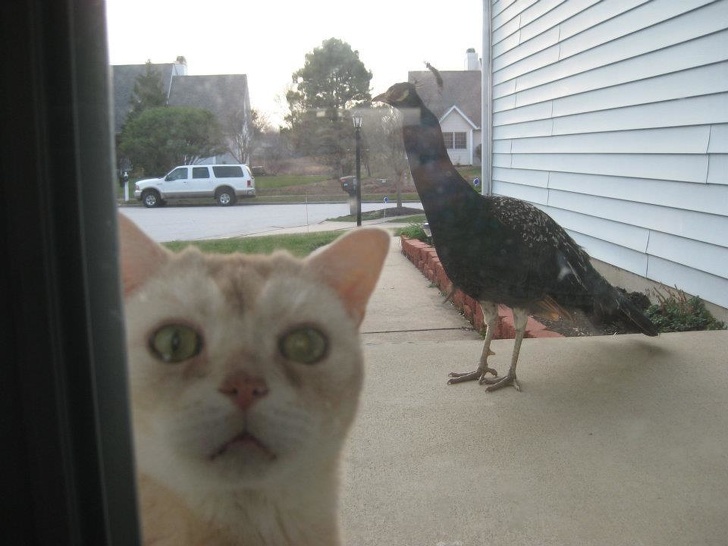 It looks like this kitty is in a hurry to get inside as quickly as possible and we guess the reason for that rush is the size of the peacock behind it! We all know that cats have natural hunter instincts, but they pick on animals their own size or smaller. Of course, there are exceptions and some felines attack dogs that are ten times their size. In this case, however, the cat realized that it could not be able to handle that bird. Sometimes our day goes by in a totally different way compared to the way we imagined it to be. 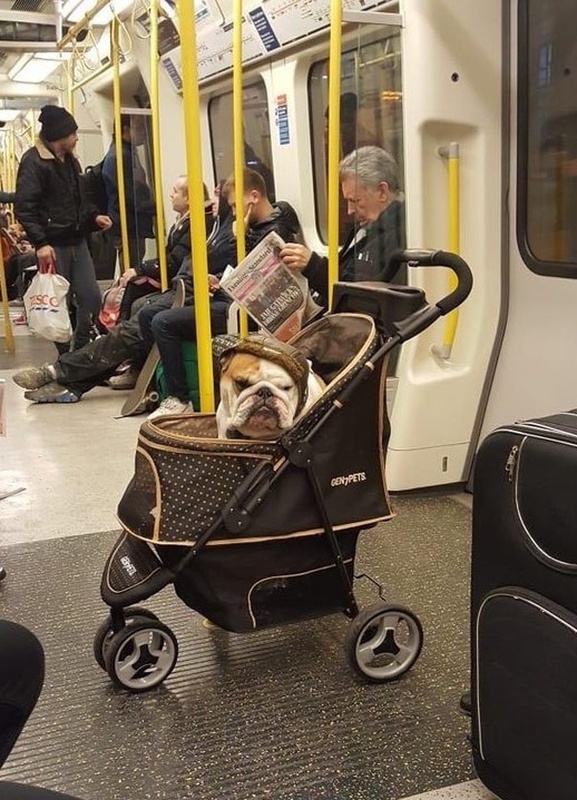 As you can see, this bulldog probably had different ideas, but it ended up stuck with their owner in that baby stroller. Commuting is boring and we guess the doggo is not amused at all. Bulldogs have a similar facial expression in most of the times but we believe that this particular one is more or less annoyed about how its day went so far. Well, sometimes things simply do not work as they should which is a bummer, but it happens a lot. This cat experienced exactly that when it tried to sneak out a trophy it stole. What makes matters worse is that its owner saw the whole thing and caught the thief red-handed! 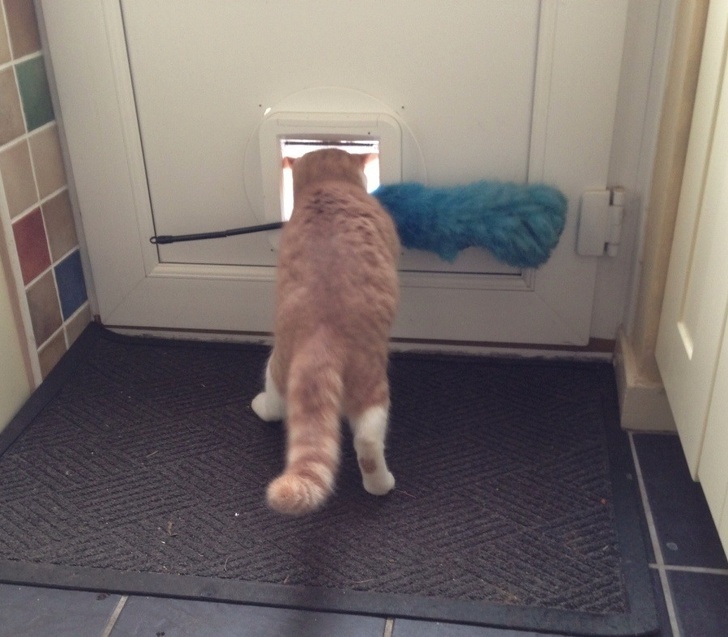 Instead of punishing the cat, the owner decided to take a photo of the cat’s failed attempt to sneak the item outside.